Amidst our hectic school schedules, you may have heard faint tunes drifting from the canteen during your breaks. Your first thought might be that the canteen speakers are actually working properly, but upon walking closer you will realize that this music is coming from buskers, live from the canteen walkway. Indeed, many groups have called for the help of student buskers, whether to raise funds or for publicity. This year has seen groups like Community Advocates, ISLE and Red Cross calling for buskers to help with fundraising, and members of Raffles Rock busking to publicize their own concert. As an audience member of many of these performances, I’ve heard exclamations along the lines of “Wow, they sound reallyyy good” and “Our school should have these things more often”. Other than achieving the ultimate goals of raising funds and more visibility for events, these performances are a source of enjoyable entertainment that add a touch of vitality to the admittedly dreary atmosphere in school. Looking at the wider Singapore context, we frequently see buskers on the streets, especially in busy city areas with high human traffic. 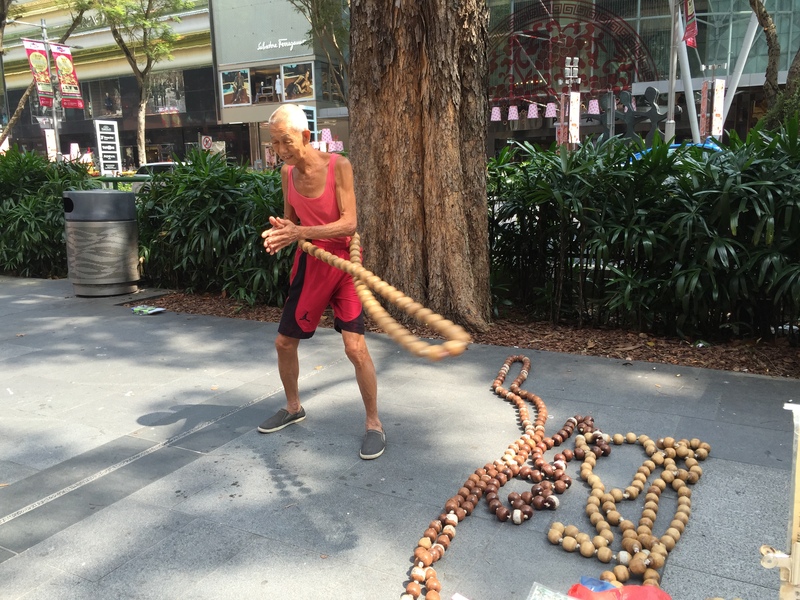 Despite the presence of other unconventional forms of busking, like an elderly man who swings “Woodball Woola Chains” around his body and a juggler who used to appear along Orchard road, buskers in Singapore mostly fall into the music/singing category. From the old uncle playing the erhu to the undergraduate strumming an acoustic guitar, these buskers add vibrancy and provide relaxation in the monotonous, fast-paced Singapore streets. At the same time, aspiring artists can showcase their talents in the hopes of further performance opportunities and making a name for oneself. Although the phenomenon of busker-to-billionaire may be uncommon in Singapore, many renowned artists in the West, like Ed Sheeran, Tracy Chapman and Rod Stewart, began their careers as street performers. However, compared to other Western cities where the busking culture seems to be normalized and buskers are commonplace, Singapore still seems to lack the openness and appreciation required to fully support this culture of public performance. Buskers here are generally decent, exuding warmth to the extent that they are easily approachable, but the “for the masses, by the masses” attitude evident in other cities still seems to be uncommon. NAC’s regulations and quotas on busking licenses could have impaired the development of such a culture. With regard to these quotas, auditions for busking licences are held quarterly, to maintain a consistent quality. These auditions simulate actual busking conditions, where applicants are required to showcase their acts in front of a panel of judges. While registration for an audition is transparent and easily accessible from the NAC website along with the terms and conditions, the discerning quality of the auditions themselves is questionable. I’ve heard vastly differing views on buskers in Singapore, ranging from complaints about the “noise” lousy buskers make to high praise for the amount of potential local talents have. Given this inconsistency in quality of buskers, can we assume that these auditions were redundant? Perhaps this judgement is subjective, and other factors are considered in the decision as to whether someone can attain a busking license or not. Furthermore, given the range of performances busking could entail, it would be difficult to judge each performance by the same set standards, as the excellence of each type of performance is dependent on different aspects. NAC uses four criteria to assess the auditionees– competency and skill in performance, expression and confidence in performance, engagement with the audience, and innovation and originality. These things can mean anything. Having such broad criteria allows it to be inclusive to all art forms, but could also make performances harder to judge. Someone who seems warm and confident to an assessor may come off as arrogant to another; something which one finds creative may be unimpressive to another. While these requirements are made clear, aspiring buskers also lack a clear idea as to the acceptable standard assessors are expecting. From this, we can see the conflict between wanting to promote an arts culture yet having to regulate these public performances. Public performances are inherently a form of expression which is difficult to judge objectively. While these regulations have their practical purposes, the inconsistency of quality control might be caused by the very fact that the criteria these performances are judged against are shaped by the nature of the arts. And this very nature is something difficult to hold an objective criteria to. Busking in itself is an art form that can reach out to people in the most intimate way. Large scale festivals and concerts can help promote the arts, but what’s the point if people are unreceptive and most don’t bother going out of their way to attend these? Lack of time and money can no longer be an excuse for enjoying a busking performance, which is inherently able to reach out and bring the arts to anyone walking past them. What’s clear is that developing the busking scene would be key to developing the arts scene here. It makes the arts easily accessible to the layman, allowing them to learn to appreciate it and subconsciously making it a part of their lives. Through these baby steps can we then cultivate a more vibrant arts culture here in Singapore. “It makes the arts easily accessible to the layman, allowing them to learn to appreciate it and subconsciously making it a part of their lives.”.